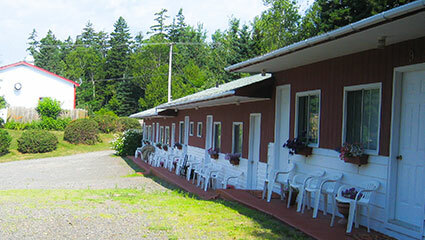 Welcome to the 45th Parallel Motel and Restaurant - the longest established dining facility and motel on Deer Island, in the beautiful Bay of Fundy, Atlantic Canada's ocean playground! Set high on a hill above Fairhaven, it overlooks Western Passage, which forms the boundary between Maine and New Brunswick. The view looks out to historic Quoddy Village. You can also dine or relax on our open-air terrace after enjoying many of the adventures or outings the Island offers. Our attractive surroundings and a comfortable, relaxed atmosphere all combine to make your stay with us on this beautiful, unspoiled Island, a memorable one. 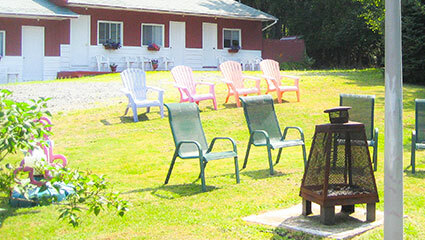 We offer 10 units at reasonable prices - and all our lodging guests receive a full breakfast included in the price! 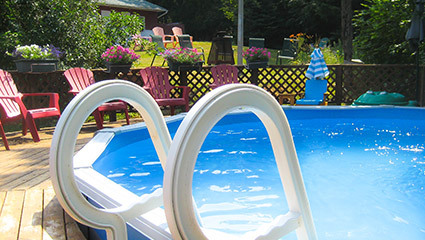 There is a shaded sitting and Bar-B-Que area on the property and also an above ground swimming pool for your enjoyment. 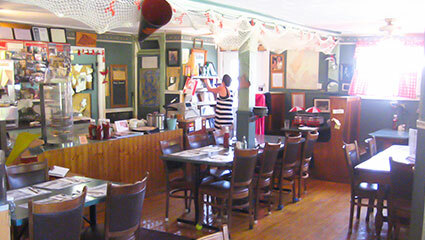 Our restaurant offers home-cooked meals in a country atmosphere and, naturally, seafood is our specialty. On Deer Island you will get an opportunity to enjoy Boat Tours, Whale watching, Bird watching, Deepsea diving, Ocean fishing, hiking, see "The Old Sow" - the world's largest tidal whirlpool, view the world's largest Lobster Pound, a sardine cannery and numerous herring weirs and aquaculture sites dotting along the coastline. And while you are here, do not miss out on the opportunity to be introduced to "Herman", Deer Island's Largest live lobster. Your host, Diane Bustin, cordially invites you to spend a day, week or your entire vacation here with us - or just drop in to the restaurant for a memorable meal if you are just passing through or staying elsewhere on the Island. We look forward to meeting you and having you as our guest. The RestaurantCome by and have a meal! Whether your dining wishes involve a full meal in our attractive dining room, a light lunch or beverage on our outdoor Terrace or a light "take-out" meal while you sit in the shade and watch the kiddies play in the swimming pool - we can supply it all for you. Our Restaurant offers a wide variety of fare including, of course, a delectable sampling of seafood including lobster and salmon dishes. For the non-seafood lover we offer a variety of meat, fowl or vegetarian dishes. You will find our prices are reasonable and the presentation and quality of our fare superb and we offer a number of meals specially designed around the tastes of the kiddies. Needless to say, being a "family" orientated Restaurant, we operate on an extremely "casual" dress basis. If your day's activities include a trip to Deer Island Point Park or a picnic elsewhere - let us know in advance and we can prepare a light lunch for you. If you have specific eating requirements, let us know in advance of your arrival and we shall do everything possible to accommodate any special dietary needs. Six public wharves present the angler with an opportunity to cast for Mackerel, Harbour Pollock and other species, and the picturesque fishing fleet, lobster traps and fish houses are ideal subjects for the artist with a brush or camera. 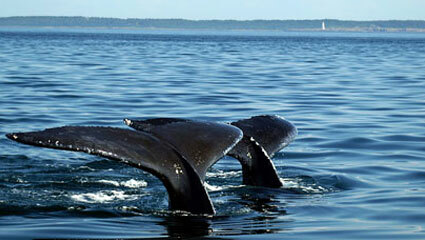 Boat tours, whale watching tours, scuba diving, and canoe and kayak adventures are also available on our island. Other attractions include a 40 acre park at Deer Island Point (just 3 miles from the motel) where the world's largest tidal whirlpool (The Old Sow) may be seen. There are several lobster pounds on the Island (including the world's largest), a sardine cannery and numerous herring weirs and aquaculture sites dotted along the coastline. Interesting things to do and see - and quiet relaxation - we have it all waiting for you. For more island information visit the Deer Island Tourism Association Website! Well kept outdoor swimming pool! Enjoy a fire after a beautiful day! © 2012 45th Motel & Restaurant. All Rights Reserved.